One of our customers asked that I might post a few of my recipes we have at our Thanksgiving dinners, so I thought I might abide that request. Here is another family favorite… it is so quick and easy to prepare and usually I have everything I need on hand. It’s cabbage season so they are always right out back, fresh for the picking… actually cutting. It’s delicious so give it a try, and if your’e not a fan of mushrooms, creamed celery or chicken soup can be substituted. Cut up cabbage in pieces and cook in salted water until tender; drain. 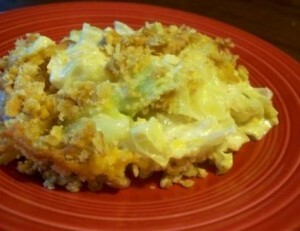 Layer cabbage, cracker crumbs, cheese in 2-quart casserole dish; sprinkle salt, pepper, and dot with butter each layer. Pour the cream of mushroom mixed with milk over top, then sprinkle with a few more cracker crumbs. Bake at 350 degrees for 45 minutes or until light brown.